But if the practice of Tai Chi — the most popular morning exercise in the world — were added to Georgia State’s men and women’s athletic program, it is possible that athletes would be healthier and discover a new sense of balance that adds agility and strength. There is a warning here. Tai Chi is difficult to learn and master, but scholars, physicians and researchers all swear there are many health, medical, physical and psychological benefits. The exercise, described as “mediation in motion” by the Chinese among its population of 1.35 billion people, is known to strengthen, stretch, balance and coordinate the integration of the left and right halves of the body with the body core and its extremities. Georgia State students — non-athletes — who take Tai Chi classes twice weekly through the Department of Physical Therapy, only imagine the benefits that university athletes could achieve if exposed and trained to this Eastern exercise that includes choreograph movements and positions, some lasting 45 minutes. During this fall semester, Purner claims to have benefited from “improved balance and coordination” and has no plans to stop practicing Tai Chi. Tai Chi differs from a workout at the spa or gym in that the movements are usually circular and never forced. The muscles are relaxed rather then tensed; the joints are not fully extended or bent. 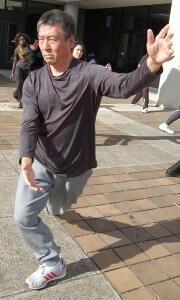 Tai Chi is easily adapted to anyone from persons using wheelchairs to those recovering from surgery. “It’s important to introduce Tai Chi at the university level,” said Fumin Xue, who teaches the single class of ‘Tai Chi: Therapeutic Exercise’ at Georgia State. Xue, 50, born outside Shanghi, China, is also the executive director at the Taichihitos’s Health Science and Culture facility. He practices alternative medicine and came to Georgia State as a visiting scholar at the University’s Center for Integrative Healthcare Research. Xue says Tai Chi has cured his 10-year stomach illness over the years. Marjorie Bennett, a thirty-something family nurse practitioner from Marietta, says Tai Chi is something she can incorporate in her fitness routine for the rest of her life, as Tai Chi trains her mind. Bennett says Tai Chi is almost like an aerobics or dance class with academic and didactic aspects integrated into the art. Anna Le, 24, a Californian from Vietnam, chose Tai Chi because the slow-motion exercise is different from what she is accustomed to. “I’ve been into fitness all my life, I am very physical and I just wanted to let my body experience a different kind of fitness,” she said. But the class was different from what she expected. “I thought we would be sitting in a classroom more, and not actually being outdoors practicing, sweating and feeling our muscles tense up. It’s a good thing practicing and strengthening our white muscles,” Le said. Le’s tips for success in the class: notes and diagrams. There are several schools of thoughts relating to the health benefits and healing properties of Tai Chi. However, even the staunchest critics suggest that the benefits should be continuously explored, studied and tested at leading universities and medical facilities. 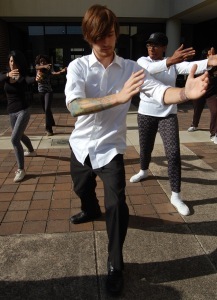 While the practice of Tai Chi is personally designed to age and harness appropriate movements, for Georgia State students they get to perform and memorize the most difficult forms in the martial arts arsenal. Fifty million Americans 50 years and older have low bone density and experience great pain and medical expense from falls. Tai Chi is now being used successfully to improve the balance of older adults and arrest the rates of bone mineral density [BMD] decline. Graduate student Rosalind Trusty, 51, of Stone Mountain is another Georgia State student taking Tai Chi for health benefits. Five years out from knee replacement surgery, Trusty claims to have an improved mind and body connection when in the gym. Trusty is not shy about recommending Georgia State Tai Chi to others.